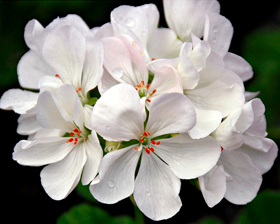 Pelargoniums are easy to grow perennials that fit well in home gardens, container gardens, flowerbeds, and even as houseplants. For growing outside sow seeds in November - May. Plant them in full or partial shade. When the weather gets cold these hardy plants will withstand light frosts and patiently await transplanting into containers to move them indoors. For growing inside sow anytime.